There it is. The word. The idea. The hot topic that permeated the North, South, and Central Halls of the 2017 NAB Show. A new journey has begun. Of course the path to IP is still very much top of mind, as it should be, making significant strides over the last year among vendors and the various IP Standards bodies. Over the course of the 4-day NAB exhibition, they presented a showcase that gave evidence to an evolving interoperability that further accelerates the digital transformation from SDI to IP to IT. But we’re a forward-looking industry, which brings us to our next destination: Virtualization. Yes, it is true that it’s still very early days and that the destination is some distance off into the future. It is important to remember that it is the journey that matters most, and there will be many decisions that will need to be made along the way. Decisions on the part of vendors that, for one example, include R&D expenditures. Decisions on the part of broadcasters regarding new workflows and resource allocations. Decisions that will affect both vendors and broadcasters such as, what is the best business model – how do you both make and save money by transitioning to software-defined, hyper-converged infrastructures? These decisions will be made. The cost-benefit analysis argument is simply too strong to ignore. Why would you have four or more individual servers, each with near-identical capabilities and features, when one server hosting four virtualized instances of the production application will do the job in a more efficient and cost-effective way? In fact, it’s already begun as actual virtualized trials and real-world implementations are now underway. Just as in the IT sector, virtualization will radically improve the broadcaster’s business agility by allocating only those content creation resources needed, and for only the time they are needed. At NAB Show 2017, ChyronHego was counted among other industry leaders who are marching into this brave new world. ChyronHego’s new Virtual Production Server (VPX) platform represents the next phase in IT-based broadcast operations by enabling broadcast news operations to run critical content creation and playout software in a virtualized, IT-based environment. 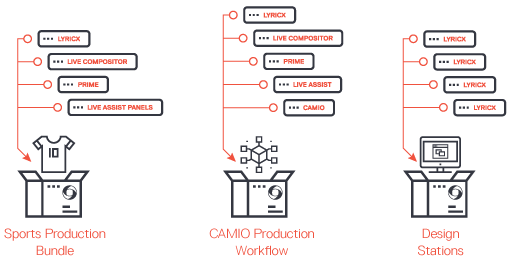 The VPX platform enables broadcasters to create highly efficient, cost-effective, and easy-to-manage production workflows for news, sports, and other programs, all from virtual instances running on a single server. Read our new white paper to see where ChyronHego believes the journey to virtualization begins, and which steps are required next to reach a fully virtualized broadcast content creation and playout workflow.